Thanks to Soldiers of Suburbia for coming and joining us on this week's episode! --Started a collection of playlists, no featuring over 60 hours of local music, with more to come! Thank you for listening, and for your support! The Breakup Songs playlist is now live on dcmusicrocks.com/playlists. Sometimes incredible music comes from heartbreak and lost love. In discovering music for the show, we’ve started collecting it. As we find it, we share it on this playlist, hoping perspective helps! Next Week - We're taking off for 4th of July & to celebrate our bday! We're back July 11th with Exte Records! Brian: On DC Music Rocks, were shining a spotlight on the great songs and incredible people behind the DC region's music scene. So, now lets get to know one of those great bands here. Soldiers of Suburbia is a three-piece alternative/pop-punk band. They can be described as high energy, loud, abrasive, and in yo face! They love the title given to them by their photographer and videographer, Rouge Crayon, who described them as a three-headed, destructive, pop-punk storm. So, that sets the stage for these great guys. I first came across them when they were- Derek Evry was on the show and introduced me to these guys and the music speaks for itself and just cool people. So, that said, I finally get to, listeners it's with great pleasure that I formally introduce Soldiers of Suburbia. Say hi, guys. Brian: [crosstalk 00:00:55] Yeah, so most folks can only hear you, so tell them who you are, your names and what you play in the band. Tyler: Hi, I'm Tyler, I sing and play guitar. Izzy: My name's Izzy, I play the drums. Collin: Hey, I'm Collin and I play the bass. Brian: Fantastic, and now Soldiers of Suburbia, so, fill us in real quick on where the name comes from, what happened with that? Brian: Oh, tell the truth, sir! Tyler: Really it's just that I'm a really big Green Day fan and Green Day has a song called Jesus of Suburbia and so the original name of the band was just gonna be Suburbia, which is actually a different cool band in the scene, but I decided that I should try to make it a little more interesting. I don't know, Soldiers of Suburbia just happened. Brian: Soldiers of Suburbia, that's amazing, and how did you guys find each other? How did the band start? Izzy: I have never not liked someone as much as I didn't like Tyler in middle school, I don't know what it was. Tyler: Yeah we just, we didn't mesh but then for some reason two years later I was looking for a drummer and she was like, "You know what, I'll give it a shot." And then we started playing together and it just, it worked out, you know? It went well. Brian: That's what I'm saying and now you're okay people you don't actually hate each other all of the time, at least. Tyler: Yeah. Most of the time. Izzy: No, I still hate them. Tyler: Yeah, we actually don't like each other at all, but and then, Collin would you like to tell the story of how we met and how I ignored you? Brian: Yes Collin, tell us. Tyler: We had an emotional connection. Brian: Unlike the hate between these other two, there was love with you guys? Is that what you're saying? Tyler: Yeah, Collin and I fell in love. Collin: Love at first sight. No, it was one of those things where it was just, you know, right time at the right place, and I, you know, reached out to him and that's pretty much just how it started. Because it was originally Tyler and Izzy trying their thing just the two of them. Tyler: Which was okay but it was not, we really needed a bass. Brian: Man, that bass frequency, I'll tell you, the bassists don't always get a lot of love, but when you don't have the bass you miss it so much, it's a thing. Tyler: Yeah, I know, they're important, you do miss it. Tyler: Yeah, so we auditioned a couple bass players and then Collin showed up and we played with him and it was pretty much a situation whereas soon as we started playing we knew that we wanted him to join the band but we had to, you know, play it cool. So as he walked away we were like, "Yeah, yeah, yeah, we'll call you man, like it's fine." And then he left and I turned to Izzy and I was like, "Yeah, it's good, he's gonna play." And then we've been playing together for a year now." Collin: The rest is history. Collin: It's nice though that we're just, you know, it's not just like a band to us. It not like, "Okay, time to go to work, we gotta play some songs, play some shows." You know, as you see we're just having a good time, it's fun. Tyler: Yeah, it's fun, we're hanging out. Brian: You all like each other now, this is good. Now, what about, so where did music come from for you guys, I mean were you band kids. What was the- how did music enter- I want to hear from each of you, how did music enter your lives? Izzy: I am a band kid. Loud and proud. Drum line, middle school band, you know, everything, very out there, very happy about it. Izzy: Everything, and I snare on the drum line, so a little bit of everything. Brian: Got it. Alright, and Collin, what about you, man? Brian: Wait, but you play bass, you played guitar? What did you start playing first? 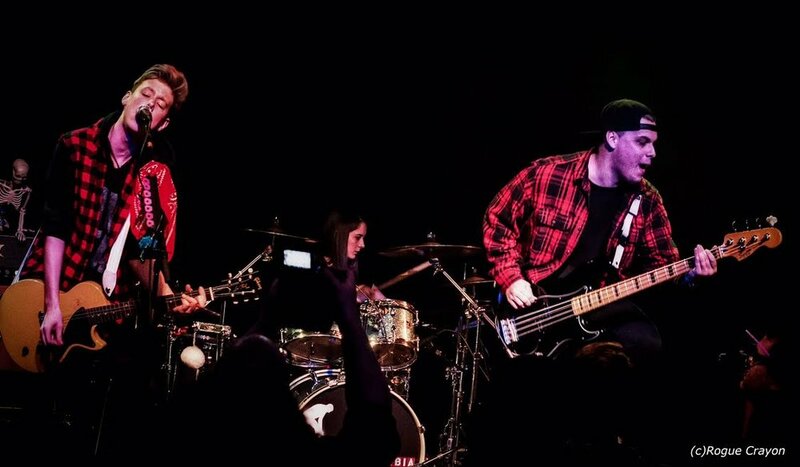 Collin: I started off on guitar and just switched over to bass and you know, eventually you know just growing up you just, all the new bands and all the new music just comes at you at once so it was kind of a, you know. Brian: So do you ever, like are you happy about the transition to bass, then? Collin: Yeah, it's definitely one of those things where it's not like I never play guitar, when I'm not doing anything. But when we do acoustic stuff I still play guitar and Tyler and I always go back and forth on, "Oh, I'm better at guitar," "No, I'm better," "I'm the song writer." Tyler: The joke I like to make, which is a very mean joke, but I think it's on the website, is that Collin wanted to be in our band so bad that he switched to bass. Collin: Yeah, I was desperate. Tyler: That he was so desperate to be in our band, which is not exactly true, but it's a funny joke to me. So, that's the joke that I always make. Brian: So tell us the truth. Tyler: I mean, it was one of those situations where he messaged me and was like, "Hey, if you ever needed a guitar player that I would love to come play with you." And I was sort of like, "Well, actually we need a bass player." And he was like, "I'll do it, like it's cool, you know." And so that was sort of how it was. It was a lot more casual than I like to make it out to be. Brian: Got it. Collin, you're the man. That's cool, alright. Tyler, what about you, man? Tyler: Well, I mean, man. I have a very similar story to Collin that we like to talk about which is I mean, I've always been around music, my aunt is a classical pianist and all this stuff. And I was learning, I took guitar lessons starting when I was four, but the one thing that really sort of grabbed me and made me want to start playing rock music is I got Guitar Hero 3 on the PlayStation. Tyler: So these are very similar stories and if you've ever played Guitar Hero 3, which I recommend it's a very good game, first you start up the game and it's Welcome to the Jungle by Guns N' Roses and that was one of those things where I heard that and my world was turned inside out. And so here we are. Brian: I love it, I love how you guys are influenced by all of these classic awesome rock songs too, it wasn't some kind of pop song, it wasn't a Justin Timberlake song, it was like classic freaking rock. Yes, guitar. Tyler: Oh, yeah, Collin and I jammed to some ACDC, and its good times. Brian: That is fantastic, alright, now what about you guys outside of music then, what other hobbies, what do you do outside of the band? Izzy: I like to bake. I bake Tyler and Collin cupcakes sometimes. Tyler: They're very good cupcakes. Izzy: I am like the best drummer that they could possibly have just because of the cupcakes. Not even based off of talent, just the cupcakes. Tyler: They're good cupcakes man, I don't know what else to say about it. Brian: One of these days, the next show, if the listeners show up, there should be some cupcakes. Don't hold out on us. Tyler: Well we used to do a thing to entice people to buy tickets, we used to say, "If you buy a ticket from us, we'll give you a cupcake." And we would put SOS on the top of it and stuff. Izzy: I would go to school, like the weekend after a show, with a big plastic bucket of cupcakes and just give them to everyone in my school who bought tickets. And it was awesome. Brian: That's funny, alright so Izzy's the baker, Collin, what do you got? Brian: And school, I take it, too? Collin: Working some jobs here and there. And like I said just trying to get by. As soon as I graduated high school in 2015 and the reality of the "real world" has slowly but surely crept into my life. Brian: Well I love that you still got the music going on dude. Collin: Yeah, it's definitely fun. Brian: Keep it going, and Tyler, what about you, man? Tyler: Yeah, I mean, music is pretty much the only thing that I'm good at. So I pretty much just sit around and play music or listen to music. I don't really know what else to say to be honest. I got a pretty cool bike the other day, so that's exciting, I don't know. Brian: Excellent, I love it, guys. Alright well, I've got one more. There's one question that I love to ask and that's if you as a band could offer one piece of advice what would it be? Collin: Don't do it, no I'm joking. Tyler: A band's a trap. Let's see, personally I would say that the biggest thing that I think the three of us have learned is that no matter what you go through as a band, it's good, like what Collin said earlier, it's good to actually be friends outside of being in a band as opposed to just being in a band because it can get stressful and it can get difficult. And it's nice that when you're in a stressful time, if you're trying to figure out how to book a show or something, it's nice that you can be like, "You know what, we should just go get some pizza and just hang out for a minute." And it's still fun and you're still in a good environment. Collin: Yeah, that's the main thing, just having fun with it, 'cause it's not like, every time we hang out, it's not where we rehearse some songs for about an hour and then we all go home and don't talk to each other ever again, and then the next time we see each other we're playing music. It's definitely not like that. I stay at Izzy's house until like 3 am sometimes hanging out. Collin: We go to the mall. Collin: Izzy and Tyler's birthday are coming up, you know, they're back to back this weekend. Brian: Now tell my what the website is for you guys if they want to find out more about you? Brian: Soldiers of Suburbia Band, check it out, and they also have information about an indie go-go campaign on there. Tyler: That is true and the link is all of our social media, which again, you can find if you go to our website. Brian: And they would love support for, this is for the upcoming album? Tyler: This is our EP, our debut EP.